I'm doing a research on free-software references in movies, TV series, etc. Things like: "in Dr. House they use KDE as DE" or "Sheldon from the The Big Bang Theory uses Ubuntu." And the like. I'd love to include some TeX/LaTeX facts, but I've not managed to find any reference. Can you help me? 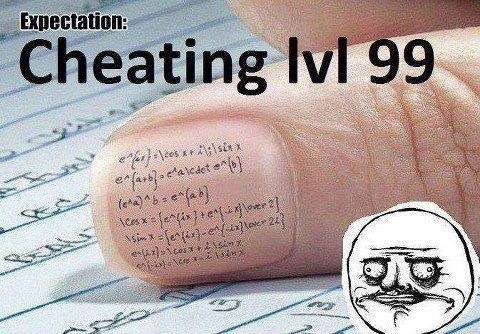 Only restriction is that the movie/TV series etc. must be English. I didn't know where to put this question so went for fun. Hope you don't mind this sort of questions, please forgive me if this is not allowed. "So you can create these tables?" she asked him. 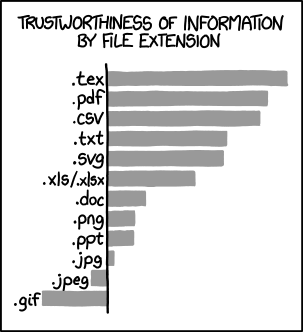 "In a form suitable for a TEX file?" TEX, pronounced like "Tech," is a computer program that's used for typesetting technical papers and books. "No," said Turner. "I don't do TEX. I do Troff (a comparable program). I guess I'll have to learn it, though. It's an invention of the devil." Here is the link to the "source"
It seems that the official site of the comic has been shut down, hence the link to archive.org. 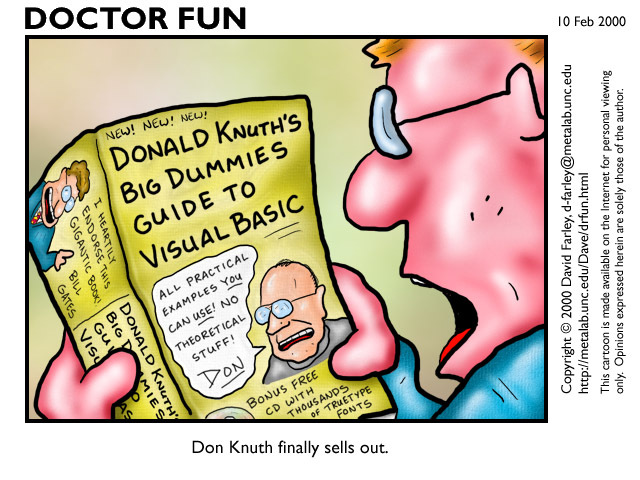 This alleged book, Donald Knuth's Big Dummies Guide to Visual Basic, is purely fictional. The central character of R.A. MacAvoy’s wonderful fantasy novel, Tea with the Black Dragon settles down to read Dr. Donald Knuth’s The Art of Computer Programming with, “a contented sigh”.